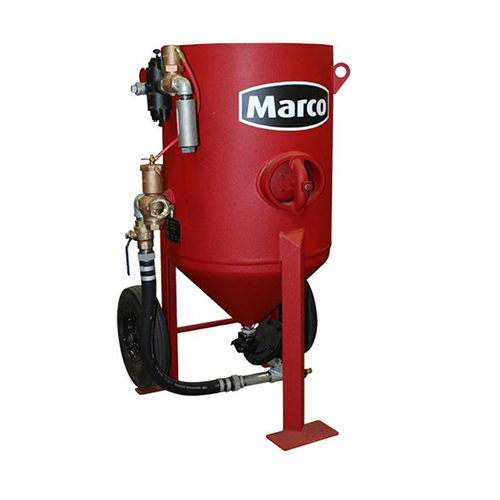 An abrasive blasting pot is a pressure vessel used to contain a supply of abrasive material during the abrasive blasting process. 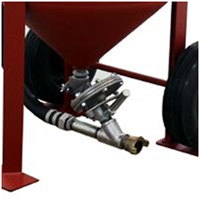 Used as part of an abrasive blasting system, the abrasive blasting pot delivers a mixture of abrasive and compressed air to the blast nozzle for surface preparation. The Blastmaster® 6.0 Cu. 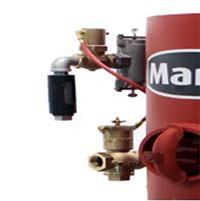 Ft. C-Series Abrasive Blasting Pot has a dual “Fail-to- Safe”, pressure-release remote control system, with independent inlet and outlet valves that close when the remote control switch is deactivated. Typical applications include blast rooms, blast yards, oil refineries, and pipelines. Common abrasives used include garnet, mineral abrasives, and slags. The Blastmaster® 125 Remote Control System allows the operator to remotely activate and deactivate the abrasive blasting pot from the nozzle, eliminating the need for a pot tender. OSHA requires an abrasive blasting pot to be equipped with a remote control system, which only operates with continuous hand pressure and deactivates upon release of the control switch by the operator (29 CFR 1910.244(b)). This remote control system meets the OSHA requirement by providing a “Fail-to- Safe” configuration, which will deactivate the remote control system in the event the operator drops or loses control of the remote control switch. 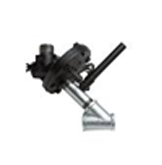 A heavy-duty handle, 16” semi-pneumatic tires, and lifting lugs allow the abrasive lasting pot to be maneuvered quickly and easily around the work site. The Blastmaster® 6.0 Cu.Ft. C-Series Abrasive Blasting Pot steep angle, 90° cone bottom provides significantly improved abrasive flow versus a 60° cone bottom. The Blastmaster® Regulator Abrasive Metering Valve allows the operator to set and maintain a consistent flow of abrasive, reducing abrasive consumption and increasing production rates at the nozzle. The Blastmaster® 125 Remote Control System is a dual “Fail-to-Safe” configuration including a 1-1/2” inlet valve, 1” outlet valve, abrasive trap, remote control line, and a remote control switch.